Penn National Gaming Incorporated (NASDAQ: PENN) has announced that it will soon become one of the largest regional casino operators in the United States after agreeing a $2.8 billion cash and stock deal to purchase rival Pinnacle Entertainment Incorporated. Wyomissing-based Penn National Gaming Incorporated already operates 34 venues in 16 states and revealed that the agreement to buy Pinnacle Entertainment Incorporated will see this portfolio increase to 41 sites spread across 20 North American jurisdictions and encompass such prestigious properties as Cactus Pete’s Resort Casino in northern Nevada alongside Pennsylvania’s The Meadows Casino Racetrack and Hotel. The amalgamated operator is expecting to have in excess of 35,000 employees and offer around 1,300 gaming tables alongside approximately 53,500 slots and 8,300 hotel rooms, while increased economies of scale, as well as a bump in its purchasing power, could lead to annual savings of around $100 million. Timothy Wilmott, Chief Executive Officer for Penn National Gaming Incorporated, stated that the deal will allow his firm to combine the ‘highly complementary portfolios and similar operating philosophies’ of both companies in order to create ‘an unparalleled experience’ for customers while ‘generating significant value for our shareholders and business partners’. “The combined company will benefit from enhanced scale, additional growth opportunities and best-in-class operations, creating a more efficient integrated gaming company,” read a statement (pdf) from Wilmott. “Going forward, we will have the financial and operational flexibility to further execute on our strategic objectives while maintaining our track record of industry-leading profit margins and generating significant cash flow to reduce leverage over time. We look forward to welcoming Pinnacle [Entertainment Incorporated’s] talented employees to our team and to further enhancing our status as North America’s leading regional gaming operator.” Penn National Gaming Incorporated explained that the acquisition, which has already been approved by the boards of both companies and is now expected to close during the second half of next year, will see Pinnacle Entertainment Incorporated shareholders receive a $20 cash payment along with 0.42 of its own shares for every common stock they hold in Pinnacle Entertainment Incorporated. It declared that this effective $32.47 individual share purchase price represents a 36% premium based on the value of its target’s stock as of the close of business on October 4. “Pinnacle [Entertainment Incorporated] shareholders will receive immediate value from the cash consideration as well as participation in the longer-term growth of Penn National [Gaming Incorporated] that we expect will occur from the integration of these two great companies into a more efficient and larger-scale gaming entertainment platform,” read a statement from Anthony Sanfilippo, Chief Executive Officer and Chairman for Las Vegas-based Pinnacle Entertainment Incorporated. As part of the deal, Penn National Gaming Incorporated moreover detailed that Pinnacle Entertainment Incorporated will be selling off four of its properties in Indiana, Ohio and Missouri to rival Boyd Gaming Corporation for $575 million in cash. 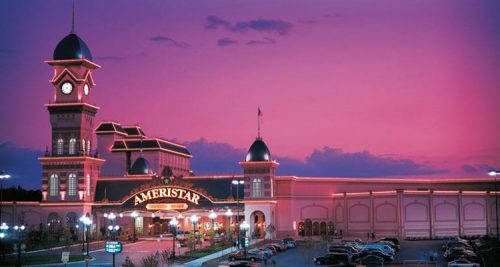 This stipulation is intended to allay competition concerns and will involve the Belterra Casino Resort, Belterra Park Gaming, Ameristar St Charles and Ameristar Kansas City venues changing hands. “We look forward to working closely with Penn National [Gaming Incorporated] and Boyd [Gaming Corporation] to seamlessly transition the Pinnacle [Entertainment Incorporated] businesses to their respective new owners,” read the statement from Sanfilippo.